"Transforming the ordinary into extraordinary"
This Clear Acrylic 34 inch long curtain panel wand does not scratch glass and includes universal adapters to work with all curtain styles. Each wand includes a ring adapter for grommet panels, a clip and ring adapter for flat panels, back tab curtain panels, rod pocket curtain panels, tab top panels,and European Ring Top Panels. There is No need to Sew! Here is an easy solution to hemming curtains. Best part is, it's easy to use and is ready in seconds, and 100% washable too! 19mm wide Iron-on Hem Tape (10m long) comes in two weight gauges to accommodate most fabrics. The Regular weight works great for Sheers, Faux-Silks and Voiles. Ex-Hold Weight is made for Cottons and Blends, Linens and Faux-Linens and Heavier Fabrics. Easy to use instructions are featured on the product packaging. Simply fold fabric to desired measurements, place the hem tape between the folded portion, cover fabric with a damp cloth to prevent scorching, and press with iron for five seconds. 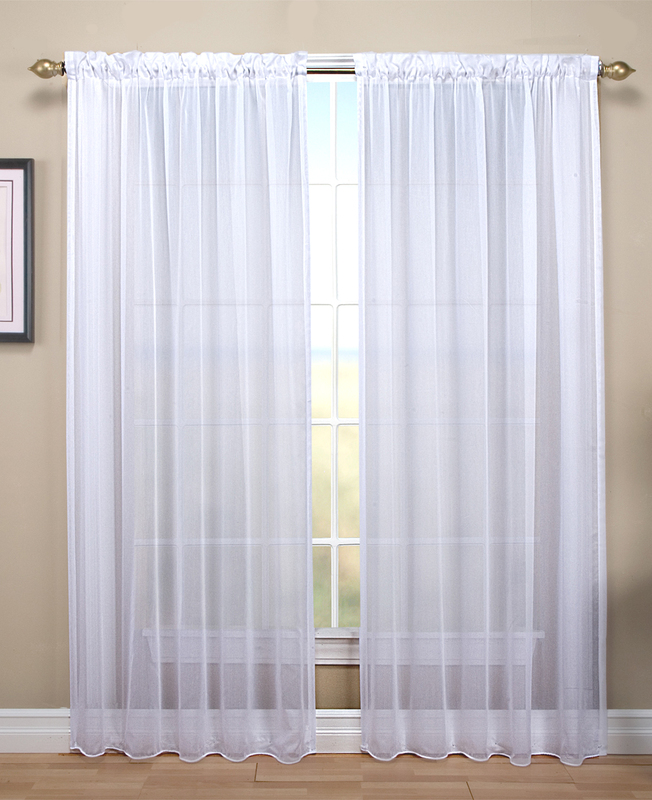 The Domino Insulated Back Tab Curtain Panel by Thermalogic and Commonwealth Home Fashions offers a beautiful and sophisticated pebbled look. Each Panel, sold separately, features seven tabs behind a three inch rod pocket (for a 2 1/2 inch continental rod, one inch side hems, and a three inch bottom hem. Available in Ivory, Charcoal, and Spa Blue. Each panel is 50 inches wide and offered in lengths of 84, 95, and 108 inch lengths. Machine wash in cold water. This unique panel is woven in three layers using a tight weave of colored yarns in the front and back, sandwiched around an inner layer of black yarns. Pull it across your window and voila! This black out panel really works! Two way pocket panel has a four inch rod pocket with belt loops on the back. Use rod pocket to shirr panels on the rod for a gathered look, or thread rod through the belt loops to create crisp folds down the front of the panel. Panels have five inch bottom hem. Made of 100% Polyester. Machine wash and dry. Panels are packaged and sold individually. Use two panels for a standard single window. This lovely linen blend panel looks great plus its double lining will keep you warm and snuggled during the cooler months. It's great for summer too, insulating against damage from harsh sunlight. This panel has, not one, but TWO linings! The outer lining is 80% Polyester/20% Cotton. The inner lining is 50% Polyester/50% Cotton Flannel for extra insulation. There are two ways to hang this versatile panel: shirr the panel on the traditional 3" continental rod pocket for a gathered look, or thread your decorative rod through the attached belt loops to create a crisp pleated look. Other features include 1" side hems and generous 5" bottom hem to create a neatly tailored overall appearance. Fontaine looks like Dupioni silk with its soft, slubbed richly textured look. This easy care polyester fabric is lined with a supple room-darkening acrylic layer to keep your room cool in the summer and warm in the winter months. Now you can have great insulating and room darkening benefits with this beautiful faux silk curtain. Each panel comes with a pull wand that can be attached to either side of the panel. * Back Tabs: Thread through loops. Wanda pleat style panels are specially designed to open and close with the greatest of ease because they slide easily on smooth surfaced loops that create soft pleats when open. 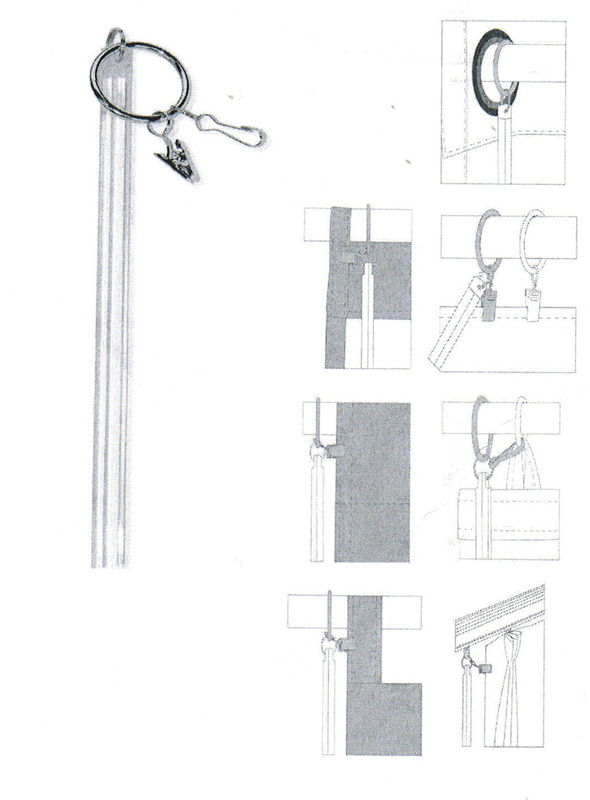 It is best to use a decorative rod for this method of hanging. * Rod pocket: Shirr your curtains through the 3" rod pocket for a nice gathered look. Use a 2 1/2" continental rod to hang this way. A decorative rod can also be used. Made of 100% Polyester, imported. Machine wash gentle cycle cold water, tumble dry low heat, warm iron touch-up as needed. Fontaine Wanda pleated insulated curtains give you the best of both worlds: a beautiful window panel that also cuts down on your home energy costs. These curtains have the appearance of one of the world's most famous silk weaves. 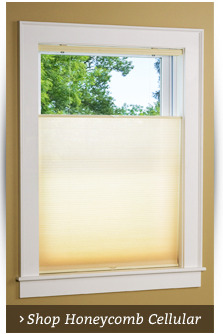 It is incredibly lustrous, and offers a heft that will add luminous appeal to your windows. While real Dupioni silk has surface irregularities, these pleated insulated curtains have just the right amount of eye-catching texture with a beautiful, uniform sheen. Available in a soft palette of four modern colors, the insulation in these curtains blocks out unwanted heat from outside and prevents warm air from leaving a heated home, meaning your inside temperature stays more constant and more controllable. 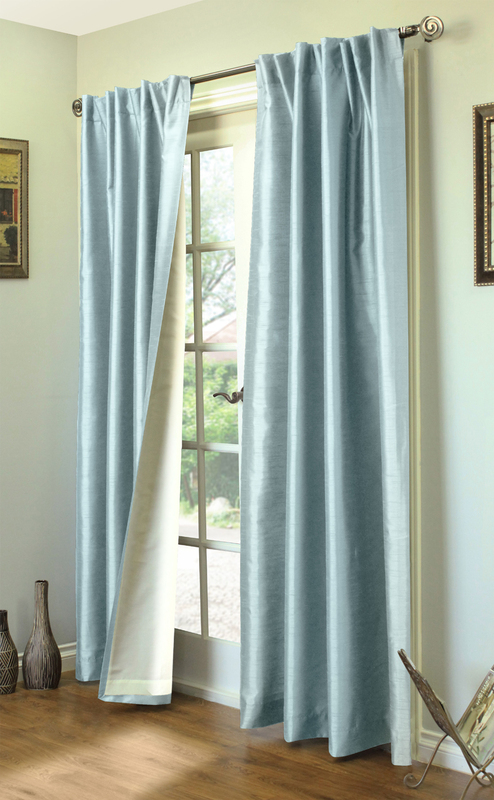 You'll love the softness of our beautiful Glasgow curtain panel. It's "two ways to hang" styling enhances its versatility. The 3" rod pocket has sewn in belt loops on the back side. You can gather the panel on the rod for a traditional look, or thread the rod through the back tabs for a sharp pleated appearance. Dimensions: 56"Wide per panel. Select Lengths 63", 72" and 84". Panels sold separately, one per package. Made of easy care 100% Polyester, machine wash cold water on gentle cycle, tumble dry on low heat. Coll iron touch up as needed. Five colors: Grey, Cornflower Blue, Harvest, Spanish Moss, Pomegranate, Gold. Luxurious faux silk with a flocked scroll design. Photograph features Antique Blue ground with Chocolate Flocking. Panels are fully lined in White Polyester with no header. 3" rod pocket has tabs in back giving you a choice of either a gathered or pleated look. Photo illustrates using the back tabs to create a pleated appearance. Colors: White/Black, Cream/Beige, Antique Blue/Chocolate, and Merlot/Gold (click on color bar to enlarge). Panels are sold separately, each 55" wide. Choose lengths of 84", 96", or 108". Face is 55%/45% Poly/Nylon blend. Dry clean. Fully lined, panels sold separately. 112"W x 84"L Patio Panel with detachable wand. Both functional and decorative, this unique Jacquard fabric is woven in three layers of woven black yarn for maximum room darkening capability. The fabric thickness and density help reduce outside noise, and is energy-saving properties block drafts in the winter and help keep rooms cool in the summer. The handsome fabric face is adorned with a burst of vertical dots. There are two ways to hang this versatile panel: gather the panel on the traditional 3" continental rod pocket for a gathered look, or thread your decorative rod through the attached belt loops to create a crisp pleated look. 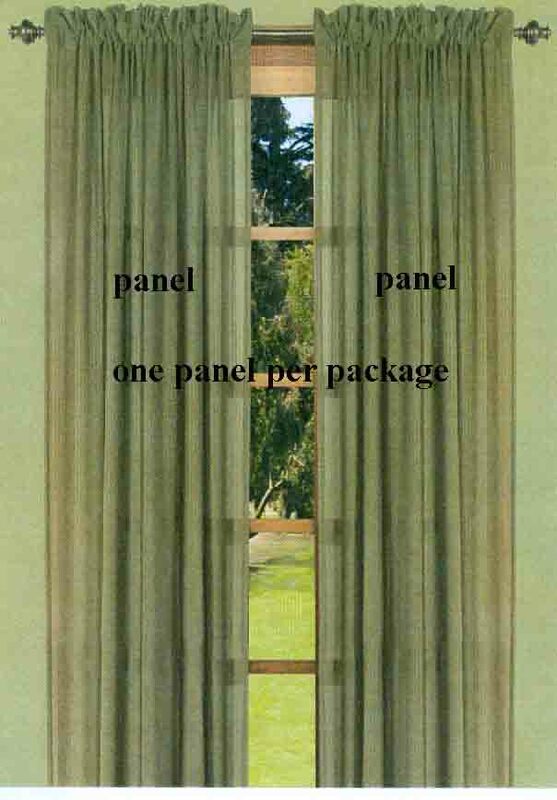 The Patio Panel is 112" wide by 84" long and includes a detachable wand for easy open and close. Wand can be attached to either side of panel. Machine wash in cold water in gentle cycle, tumble dry on low heat, warm iron touch up as needed. Lucerne Semi-Sheer Rod Pocket Panel features a lustrous and expensive looking dry hand linen look for the phenomenal price of easy care Polyester! Enjoy the flexibility of our two way rod pocket Lucerne Semi-Sheer Panels. Dual rod pocket allows you hang them using the 3" rod pocket or the 1 1/2" rod pocket, thus utilizing a 2 1/2" Continental curtain rod or the standard 1" curtain rod. A decorative rod in a range of diameters can be also used. * use two panels for a standard window. 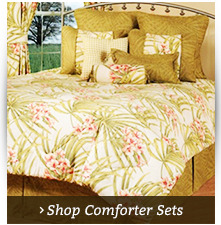 Colors include Ivory, Linen, Custard, Butterscotch, and Olive. Machine wash cold water on gentle cycle, tumble dry low heat, low iron if needed. 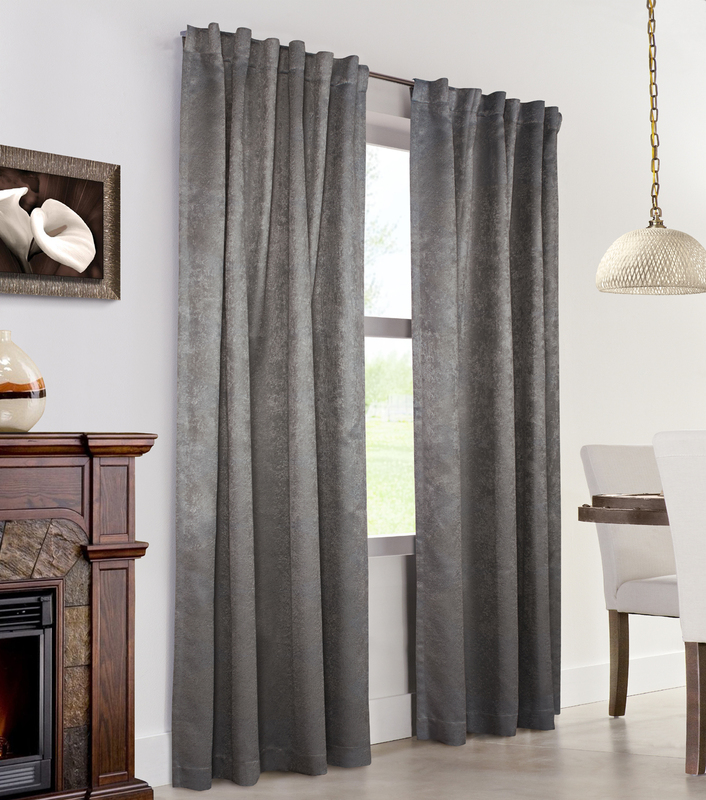 Update your windows with these beautiful faux silk curtains. Looks and feels like real silk; you won't believe it's easy care long lasting Polyester! Economically priced and the six gorgeous metallic looking colors blend well with most room decor. Features include a three inch rod pocket with back tabs, three inch bottom hem and one inch side hems. * thread your curtain rod through the back tabs and evenly space for a crisp pleated look. * gather the drapery panels through the three inch rod pocket for a more traditional gathered look. Either way, allow for a approximately two to one ratio of fullness by measuring the length of your rod and doubling it. Use a decorative one inch to one and one half inch diameter rod for hanging. Fabric Content: Face and Lining is 100% Polyester. The Two Way Rod Pocket Panel has a 3 inch rod pocket that can be used with a decorative rod up to 1-3/4 inches in diameter. But it also has a standard 1-3/4 inch rod pocket sewn inside the larger rod pocket. The standard rod pocket will form a ruffled header above the rod pocket. Tergaline is an incredible sheer with extraordinary qualities. This elegant soft sheer, with its unique weighted corded hem, creates gentle folds and drapes beautifully. It's the perfect fabric weight to create an attractive silhouette while providing filtered light and glare for a comfortable room ambience. For luxurious fullness consider using panels allowing two times the width of your window. Panels are 54 inches wide and come in lengths of 63 inch, 84 inch and 96 inch lengths. SEAMLESS Double Wide Panels measure 108 inches wide and come in lengths of 63, 84, and 96 inches. Made of 100% easy care Polyester. Machine was in cold water on delicate cycle, line dry, and touch up if needed with a low iron. Dual header curtains are an easy way to dress up your windows and patio doors. 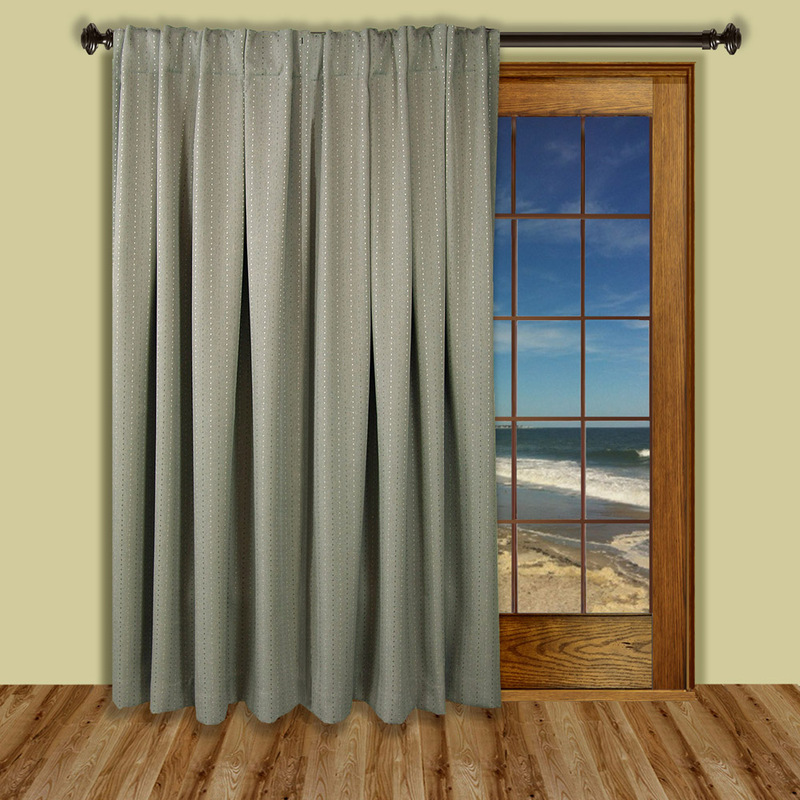 TheCurtainShop.com carries an amazing selection of dual header curtains to choose from that will have your windows looking fabulous. Dual header curtains can be hung 2 different ways: Using the rod pocket for a traditional gathered look or using the back tabs for a pleated look. 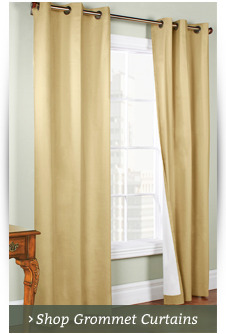 Either way, our dual header curtains will have your full-length windows looking amazing. 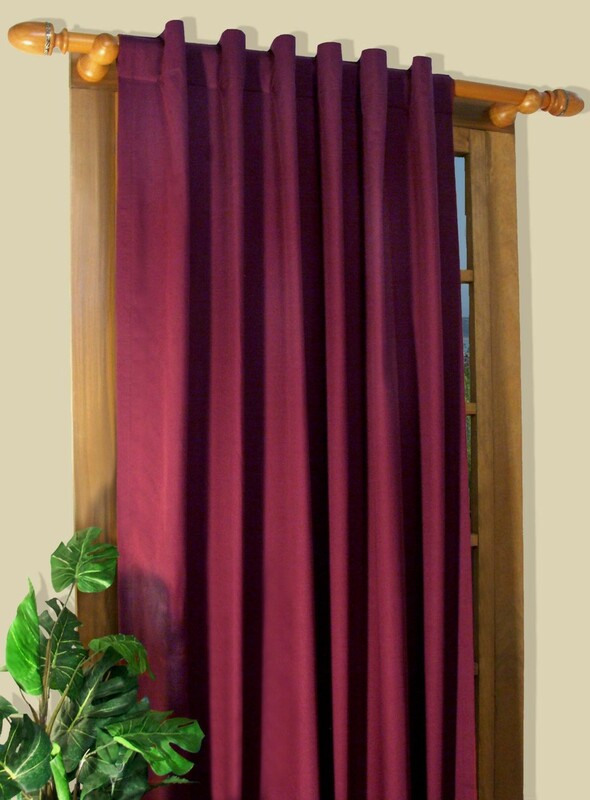 The Curtain Shop also carries insulated dual header curtain panels. The insulated panels are simple and stylish, but also make your windows more energy efficient. Insulated curtain panels can make a room warmer in the winter and cooler in the summer by reducing air loss around the window. Insulated curtains are sometimes required by condominiums on patio doors and certain windows. Thanks to TheCurtainShop.com, there are plenty of stylish options to choose from. Insulated panels can also be used to help to block out sunlight, which can fade carpets and furniture over time. For those that like to keep the room a bit on the dark side for sleep, The Curtain Shop sells an ultimate blackout liner that is perfectly suited to our dual header curtains. The blackout liner keeps out the sun and dampens noises from outside for a more peaceful night's sleep. We carry dozens of rod pocket and pleated dual header curtains to choose from, but if you can't find exactly what you had in mind for your window, try our Almost Custom feature. The Almost Custom feature allows you to examine different fabrics from top manufacturers like Waverly before you buy. 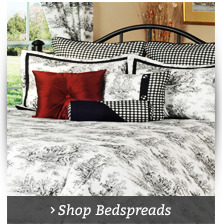 Call The Curtain Shop at 1-866-886-3632 from more information. While you're here, don't forget to pick up some rods for your new curtains. TheCurtainShop.com has a great selection of designer rods that add a touch of style to your window. Join our newsletter for the latest updates and deals!